I'm curious - what does "the act of omission by Brahmins" mean, and from which historical record was Buddhist history excised ? Buddhism was absorbed into the larger Hindu fold with the Buddha being considered one of the incarnations of Vishnu and became like many other sects that arose in India. I have borrowed the term "Brahminical omission" from the book "Ashoka: The search for India's lost emperor" by Charles Allen. Let me first give my interpretation. 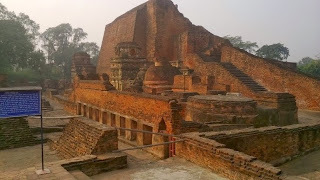 Nalanda was a popular seat of learning in Asia for a few centuries. It took European Orientalists to excavate and re-establish its importance in the 19th century. To the best of my knowledge, none of the residents from Indian sub-continent took the initiative. It was as though Nalanda did not exist. I could be wrong. I don't know how well Buddhism was "absorbed" into Hinduism. But, to me, it looks like a good technique of killing an idea - saying it is just like my idea - I will add you as as an appendix. Vinay, most ancient Indian sites have been excavated by the British / Europeans because they were curious about history and they inherently believe in evidential or documented history, while we in India have oral history and we focus more on the philosophy / lessons part of history than the names and dates per se. So what you tell about Nalanda is true and it is as much true for most other historical places in India. BTW - do you know Taj Mahal was used by the British as a party place and so were many other tombs in Delhi. Nalanda as an idea was killed because of huge change in environment - people who could have preserved it were totally disempowered and were in no position to keep that idea alive - however the ruins give an idea of the idea it was and I think they are re-establishing the university with Amartya Sen at the helm of it. Tell me today's Brahmins - what power they have to establish centers of learning and what training they themselves have undergone for the same. Which story you are referring to, Tapan? That Brahmins suggested Khilji to move towards Nalanda or Brahmins didn't do anything later to keep the history of Nalanda alive?